Wood daybeds are the best guest beds! They are also referred to as couch beds since they provide daytime seating as well as overnight sleeping space. An assortment of pillows and bolsters invite you to relax. Often, an under bed trundle is used for an extra mattress therefore a twin day bed can sleep two if you are using the trundle bed with it. Our day beds are simply our single beds with a guardrail in the back. You can choose from various finishes and bed end styles. Matching and coordinating mattress covers, back pillows and bolsters are available to give your day bed that neat, pulled together look! Day beds can be used in small bedrooms to sleep two and still free up the rest of the room. 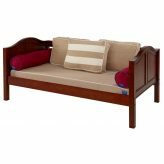 They can also be used in family rooms or other parts of the house to provide sleeping space for occasional overnight guests or even dorm rooms A daybed is a practical piece of furniture that every home should have. 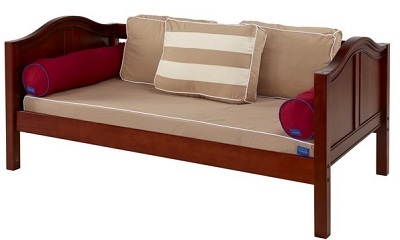 Wood daybeds make great teen room, dorm room or small apartment beds!